I won't lie; Vance has been by far the most challenging writer yet featured by the Puppy of the Month Club. I have repeatedly tried to start The Dragon Masters only to bounce off it. This is not because the quality of Vance's writing is poor. Rather, like Gene Wolfe or John Wright, the writing is erudite and requires a closer read than normal. In the case of The Dragon Masters, the introduction of a sacredote in his cell required a fair bit of concentration to fully appreciate, often more than I could bring to the work. Fortunately, the volume the Frisky Pagan selected this month has a trio of Vance's stories, and the planet-wide slave revolt and siege of The Last Castle proved to be more accessible. On an Earth far enough in the future to be depopulated and recolonized by the survivors from other worlds, nine castles are the sum total of civilization. Through technological marvels and a hierarchy of subordinate slave species, humanity rules its homeworld as feudal lords. Occasionally, the younger men would break from the unceasing pageantry of the castles to adventure among the Nomads, the indigenous survivors of Earth's fall. This decadence is bourne on the backs of the Meks, a humanoid species from another world who builds and maintains the technologies that fuel the castles' war and pleasure machines. One day, the Meks leave. All of them, leaving the castles bereft of the technological support needed for civilization. The castles limp along, until their slaves return and besiege the castles. One by one, the citadels fall until only Castle Hagedorn remains. Finally, the Meks levy their full might against the surviving remnant of civilization. In this short story, Vance poses two conflicts. The action conflict is simple: can Castle Hagedorn survive the siege? However, it is clear from the eight fallen citadels that the existing social order cannot win against the Meks. So the more important conflict is whether necessity will drive the humans to radically reorder their society or if the inertia of tradition will rule. 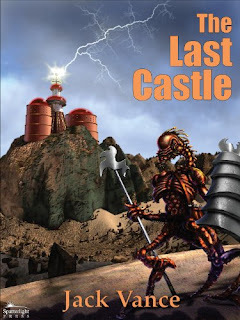 And even if necessity wins, it might be too little too late to ensure the castle's survival. The answer, of course, is for humanity to give up its slave races and abandon the castle, trapping the Meks inside. With the besiegers now the besieged, humanity's survival is assured. The Last Castle, with its aristocratic decadence, still falls, and every man now lives by the sweat of his own brow. The characters are stock, but the worldbuilding shines. From the various slave races to naming conventions to the Nomad tribes, Vance brings to life a strange future Earth full of wonders. The setting enlivens the formula of a last stand forcing social change that will reappear in The Miracle Workers. All in all, this made a more accessible introduction to Jack Vance than the other stories I tried this month. I wish I had started with this one at the beginning of the month. To me, The Last Castle is the weakest of the three, but the ending makes up for it. It shares a lot of themes with the The Miracle-Workers (my favorite,) though, so much that sometimes they seem the same story.